I'm possibly (probably) (definitely) late to the party on this, but I don't even care. 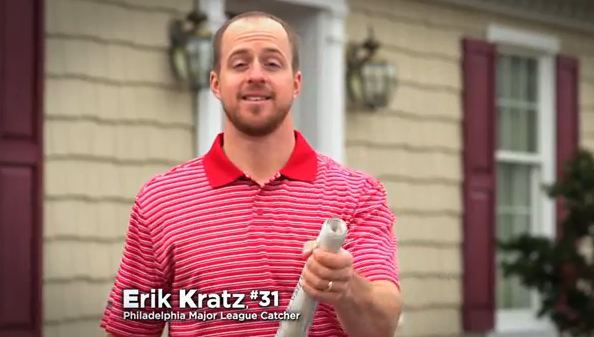 BECAUSE ERIK KRATZ IS NOW ACTING IN TURKEY BACON COMMERCIALS WITH ANIMATED CHARACTERS so you're arguments are therefore invalid. AND, there is already whole series of them (hopefully with more to come!) with him in the starring role for Godshall's Meats. Okay just stop what you're doing and go watch all three of them because they're the stuff internet bolging dreams are made of. Be sure to watch for the TURKEY PIG. "Can we get a more believable journeyman catcher? Is Costner available? He is? Good. Tell him it's for Hatfield, maybe he'll get confused and show up." That young kid is going places. He's the future of Philadelphia. I love this guy. You just want to root for him. "Alright boss, we got Galifianakis' brother to do the voice, but Chris Coste doesn't work with cartoons..."